I was a bit late for the Daughter of Smoke and Bone sequel - I felt a bit "meh" for the first one in the series. Sad to say, I also tried to pick this up twice before it actually caught my attention. Laini's book are an experience; you have to be in the right mood for her work. This was the last of my Halloween reads, so it was easier to slip back into this landscape during October. I cannot even express how overjoyed I am that I gave this story another chance. My issues with Daughter of Smoke and Bone all but dissolved in this exciting sequel. The story turn the focus away from the romance and back on the character and their struggle. I fell in love how both sides of the romance, Akiva and Karou, developed in each of their storylines. In the last book, I never really grew fond of Akiva, but by the end of the DoSaB, I found myself rooting for him. The audience finally can see how his mind works, and understand what is happening in his head and in his heart. I have to say that Akiva stole the show, and the novel developed for the better. Akiva and his sibling relationship with Liraz and Hazael steered him away from the "boyfriend fodder" trap and let his true personality rush to the surface and away from all of the muddled mess from the last book. The course of his actions and his destiny set the stage for quite a few wonderful scenes of the philosophy established from the previous book: mercy, peace, and love. It is always a breath of fresh air to read about family ties and relationships as well as budding romance. I've mentioned over and over in previous reviews that other forms of love tend to take a back seat to romance in most YA books. It is an annoying trend, in my opinion. There is an obligatory standard set by the target audience, however, not all love comes solely from romantic partners. I will always welcome a story that wishes to delve into the many forms of bonds and love in the life of a character. Karou also had many opportunities to shine in this novel, and overall, developed into a complex and multidimensional main character. In the previous installment, Karou came across as spoiled, shallow and a bit self centered. She was eccentric, but her lack of responsibility and emotional range did nothing to provoke warm feelings towards her as a person. In the second book, her whole persona is stripped clean, and a stronger, enriched girl steps out and takes charge of the course of her future. Turning Karou into a raw, battered main character who battled against her own mind and her own people was a bold step. It paid off in favor of the story. The mythology of the angel and chimera war starts to take center stage. 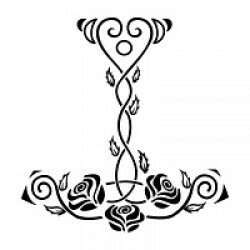 Previously, it was touched upon in the last section of Daughter of Smoke and Bone. The book begins to venture into the world that was simply hinted at previously. Instead of simply accepting at face value which side to sympathize for, Taylor now puts her readers right into the heart of her other world. Often brutal and horrifying, Days of Blood and Starlight pits morality against reason, right versus wrong, and hope against the worst odds. The story starts to lean towards tragedy, and the climatic event for both sides will rip the heart right out of the reader. This book is going to expose some raw feelings and new respect for the two sides of the ethnic war raging inside the series. There was very little I disliked about the book. Zuzana is, sadly, still annoying and still seems to come off as arrogant and needy. I really wish I could bond with this character, but everything about her causes me to roll my eyes when I am forced to read about her. Overall, this is a solid follow up to the first story. 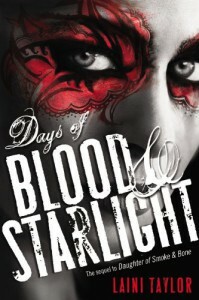 It is rare to see a sequel surpass the first book in the series, but Days of Blood and Starlight fairly won the right to become the strongest book (so far).